At just four months old, Jashawn Howard started showing symptoms of being sick – his skin was pale, his eyes were weak, and he had labored breathing. Concerned, Rashundra, Jashawn’s mom, immediately took him to the Emergency Room at Phoenix City Medical Center. The doctors in the ER ran a series of tests, but were unable to determine exactly what was going on with Jashawn. Unfortunately, the severity of the results forced the doctors to airlift him to Children’s of Alabama to better understand what was happening. After running more tests in Birmingham, results confirmed that little Jashawn was in complete kidney failure. He immediately went into surgery where a PICC line was inserted to start him on hemodialysis, which would be administered for four hours a day, three days a week. Rashundra was overwhelmed and devastated. Her perfect little boy was now hospitalized until they could stabilize his condition. He was in and out of surgery because his PICC line kept becoming infected and had to be replaced. While Jashawn was receiving hemodialysis, his mother was referred to the Ronald McDonald House. This was the perfect place for her because it was close to the hospital, safe, and provided all of the amenities that made her feel like she was at home. 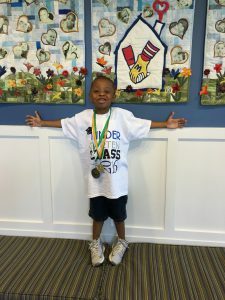 Because of the convenience and cleanliness of the RMH, Jashawn was discharged from the hospital and released to stay at the Ronald McDonald House. Jashawn very quickly touched the hearts of other guests, volunteers and the staff at the RMHCA. They stayed at the House for 405 days before Jashawn was able to go home and start his Peritoneal Dialysis (home dialysis), which is much different than inpatient dialysis. Home Dialysis required Jashawn to be dialyzed for ten hours a day, seven days a week. Seven months later, Rashundra received a phone call telling them to pack up and get to Birmingham. Jashawn was getting a kidney! After five hours of surgery, the doctors met with Jashawn’s mom and explained that everything went well. Soon after, he was released from the hospital and stayed at the Ronald McDonald House for another hundred or so days so the doctors could closely monitor his new kidney. Jashawn is now a happy, active, outspoken, and quite feisty little boy who often comes to visit his friends at RMHCA.